Everyone who has read a little bit about film remembers montage as what Eisenstein did. But Découpage? Unusually, wiki does not provide an answer. Jonathan Rosenbaum posts up his découpage entry for what he says was an aborted Oxford Companion to Film. GoogleBook of Film Editing By Valerie Orpen, elucidates more and ties it in with editing. 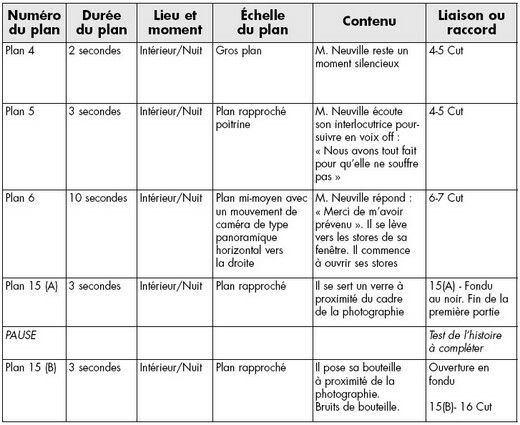 There were [..] five stages listed in script development “manuals”: the synopsis, the traitement, the continuité, the dialogues or continuité dialoguée, and the découpage techniqué. Frequently, mention is made of a prior “stage”, the idée de film, which might be an anecdote noted in a few lines or at most a few pages. has three beginning pages of “The Decoupage” by Henri Diament-Berger from the “Le filmage” section of a book called Le Cinéma. This is very useful because he gives an example of a decoupaged scene: a numbered list with meters of film to be used in each shot. He then goes on to mention logical decoupage. How meters of film convert to mins/secs, would be nice to know. Suppose if one knew how many frames per meter (we already know 24 fps), tout a fait. This Screening the Past review of Valerie Orpen’s Fim editing: the art of the expressive, points out the not always obvious point: editing as cutting and joining. Chapter 6. Shot and scene. As usual there are vital pages missing, but enough to get the general idea plus some. Look on these annoying missing pages not as a reason to have to buy the book, more like the discovery of a pile of dusty out takes from which you are painstakingly reconstructing the mind of the long gone editor of some unnamed film. For the beginner, the first paragraph can be quite sufficient to mull over. Though what there is of the rest of the chapter is fascinating stuff. Anyone know what a timer is? Well, here you learn this job was to work out the total running time of a script. Using the search option in GoogleBook to find the other mentions of decoupage. An over 300 page book – no index; no mention of découpage.